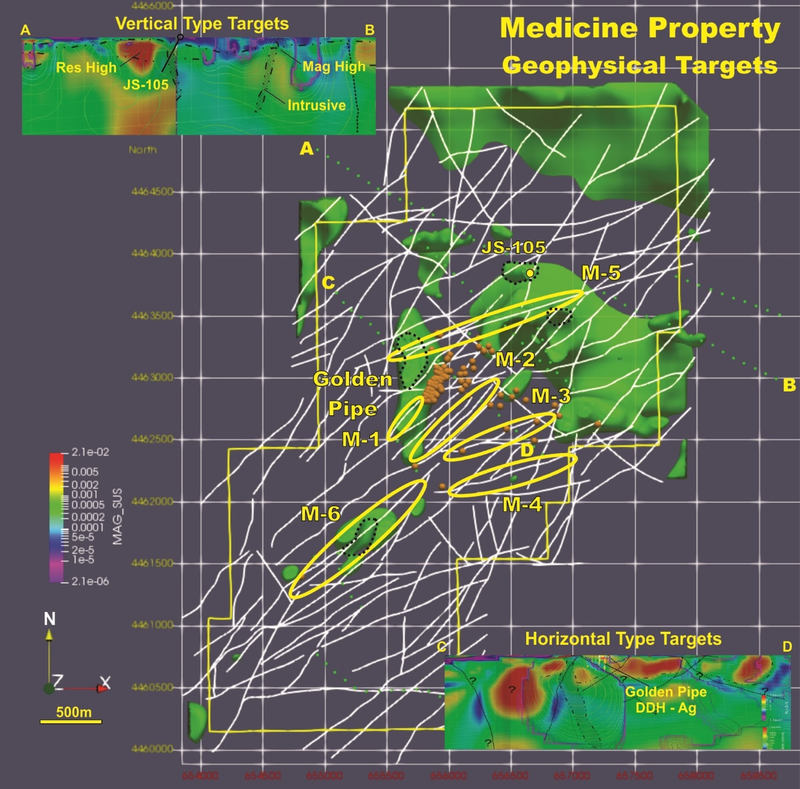 Northern Lights Resources (CSE:NLR) (the “Company” or “Northern Lights”) is pleased to announce that geophysical and geological mapping and sampling work completed by the Company during the 2018 field season has identified six mineralization target zones at its Medicine Springs silver-zinc-lead project located in Elko County, Nevada. In 1997-1998, Cominco American Inc. carried out Controlled Source Audio-frequency Magnetotellurics (CSAMT) and Induced Polarization (IP) geophysical surveys over the Medicine Springs Property. Cominco completed nine lines of CSAMT and a single line of IP. Northern Lights engaged Zonge to complete a 2D inversion of the Cominco geophysical data. In August 2018, Northern Lights engaged MWH Geosurveys to acquire aeromagetic data over the entire license area. The data was acquired using a quad-copter drone and a towed cesium vapour magnetometer. Line spacing was 50m and the flying height was nominally 30m. The magnetometer sampled at 10Hz resulting in a nominal along ground sample interval of 0.7m. A total of 810 line km of aeromagnetic data was acquired. In October 2018, Northern Lights engaged independent geologist William J. Tafuri PhD to complete detailed surface mapping and rock sampling of the Medicine Springs mineral license area. The mapping work was completed in November 2018 on a 1:5000 metric scale. In November 2018, Northern Lights completed a soil sampling program over the entire Medicine Springs license area on 100 meter centres. A total of 794 samples have been taken and will be assayed by ALS in Vancouver using a 62-element Ionic Leaching analytical method. Assay results are pending. The results of both the CSAMT/IP and Aeromagnetic surveys were reviewed and interpreted by GeoExplore Pty Ltd, an Australian based geophysical consulting firm. The geophysical survey results have identified six key targets with potential for mineralization based on structure and proximity to interpreted intrusive dykes. Some of these targets lie at an approximate depth range of several hundred meters from surface. The geophysical targets comprise 2 types, flat lying carbonate replacement targets and sub-vertical target associated with intrusive dykes. – M-1 is the SSW extension of the Golden Pipe trend in an area that lacks drilling. – M-2 lies immediately east of the Golden Pipe trend and from a structural perspective have many analogues with Golden Pipe. The southern half of M-2 is coincident with a strong Pb-Zn soil anomaly identified by USMX in the 1980s. – M-3 follows a fault which has an ENE-WSW orientation, and which has already attracted several historical very shallow drill holes. – M-4 is a parallel structure which does not appear to have attracted past attention. – M-5 is the structure identified in the CSAMT which crosses a line between the Golden Pipe trend and drill hole JS-105. – M-6 covers a structure parallel to the Golden Pipe trend which is associated with magnetic zones, interpreted as intrusive dykes. The identified geophysical targets, historical drill holes locations and interpreted intrusive dykes are illustrated on Figure 1. Figure 1: 3D model showing magnetic interpreted structures, drill hole collars (orange), CSAMT lines (dotted green line) and interpreted intrusive dykes (dashed black line) overlain on an isosurfaces of 0.00075 SI. The geological mapping program included the review of the surface geology and the collection of 45 grab samples. The mapping has defined an area of veining and alteration over a strike distance of approximately 2.4 km with a width up to 0.8 km. The surface sample assays exhibit a unique geochemical signature that includes Pb, Zn, Ag, Ba, As, Sb and Mn. Additionally the presence of reactive Permian carbonates cut by altered Teritary dykes supports a distal carbonate sulphide replacement model similar to the Taylor Pb-Zn-Ag deposit owned by South 32 following the acquisition of all the issued equity in Arizona Mining Inc. in 2018. The top of the Taylor sulphide deposit occurs at a vertical depth of 300 meters with the majority of the tonnage found below a depth of 500 meters. – Extremely deep oxidation more than 180 meters. At Taylor the oxidation is primarily due to the weathering process of a high sulfide system while at Medicine Springs, the presence of sulphides has not been encountered yet due to the very shallow nature of the drilling. – At Taylor, the oxide/sulfide mineralization is selectively hosted by three lower Permian carbonate formations while at Medicine Springs, the lower Permian carbonates units have yet to be explored. – At both properties, an early stage of stratiform replacement mineralization is cut by a later stage of high grade veins and breccias. – The mineralized footprint at Taylor is of similar size as the surface alteration, geochemical and geophysical footprint at Medicine Springs. – Geochemical signature and alteration of the mineralization are similar. Assay results from the ionic leach geochemical soil survey are pending. Once received the soil sampling results will be compiled with the detailed surface mapping and outcrop sampling, geophysics, historic exploration drilling to further define exploration targets for both the oxide and carbonate replacement target zones. The discovery of an economic carbonate replacement sulphide deposit at depth below the oxide zone. About Northern Lights Resources Corp.
Northern Lights Resources Corp is a growth oriented exploration and development company and is earning a 100% interest in the Medicine Springs Project, a prospective zinc-lead-silver property located in southeastern Elko County, Nevada. The Medicine Springs property consists of 149 unpatented mineral claims (1,189 hectares) and is an advanced exploration project with extensive drilling and many significant silver-zinc-lead intercepts. The geological information in this news release has been reviewed by Mr. Gary Artmont, Head of Geology for Northern Lights and is a Qualified Person under the guidelines of National Instrument 43-101. Northern Lights Resources trades under the ticker of “NLR” on the CSE. This and other Northern Lights Resources news releases can be viewed at www.sedar.comand www.northernlightsresources.com. CAUTIONARY STATEMENT REGARDING FORWARD-LOOKING INFORMATION: This news release includes certain “forward-looking statements” under applicable Canadian securities legislation. Forward-looking statements include, but are not limited to, statements with respect to: the terms and conditions of the proposed private placement; use of funds; the business and operations of the Company after the proposed closing of the Offering. Forward-looking statements are necessarily based upon a number of estimates and assumptions that, while considered reasonable, are subject to known and unknown risks, uncertainties, and other factors which may cause the actual results and future events to differ materially from those expressed or implied by such forward-looking statements. Such factors include, but are not limited to: general business, economic, competitive, political and social uncertainties; delay or failure to receive board, shareholder or regulatory approvals; and the uncertainties surrounding the mineral exploration industry. There can be no assurance that such statements will prove to be accurate, as actual results and future events could differ materially from those anticipated in such statements. Accordingly, readers should not place undue reliance on forward looking statements. The Company disclaims any intention or obligation to update or revise any forward-looking statements, whether as a result of new information, future events or otherwise, except as required by law. Click here to connect with Northern Lights Resources (CSE:NLR) for an Investor Presentation.